The Finish @ Coil E1 Electric Coil Inserter and Cutter Crimper is one of the most easy to use coil finishers that you can find in the market today. This machine is designed with one goal in mind, which is to provide the maximum productivity with quality results while requiring minimum efforts from the operator. With its adjustable full-size rollers, this high-capacity electric coil inserter makes coil inserting extremely fast and easy, even on the extra-large diameter sizes. Furthermore, with the built-in electric coil crimper, coil diameter scale, coil diameter selector, pitch identifier, and U-shaped alignment channel this machine will make your coil binding experience easier and faster than ever. With the Finish @ Coil E1, you will easily and quickly crimp off the excess coil in your book with a simple press of the foot pedal. The Finish @ Coil E1 is ideal for operators that demand maximum productivity & best binding results, with minimum efforts. 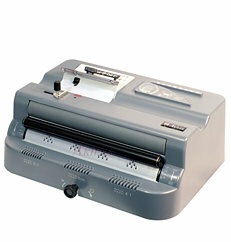 This machine is a must for all binding centers with large workloads. If you have any questions or are interested in purchasing the Finish@Coil-E-1 Electric Coil Inserter and Cutter Crimper, visit us at SpiralBinding.com. We have great pricing on a full line of Plastic Coil Inserters. Call us at 1-800-631-3572 for more information!